Man has been fascinated with keeping exotic animals in captivity. However, as zoos evolved over the years, their appearance and reasons for existence have changed dramatically. The focus of today’s zoos has shifted towards education and conservation with the hopes of making the public more aware of our world’s wildlife and the need to protect it for future generations. In December 2016, ZOO Miami opened its most interactive and extensive exhibit in its history – Florida: Mission Everglades. This $33 million 4.5 acre permanent addition is designed to encourage residents, as well as out-of-town visitors, to connect with approximately 60 species of wildlife from our own backyard, many of which are endangered or threatened. With an enduring commitment of becoming one of the world’s great zoos, what we know today as one of the world’s top zoos had its origins on Key Biscayne in the 1940s. The Crandon Park Zoo was born as the result of an unexpected donation. In 1948, a small traveling show was stranded in Miami when their truck broke down. In exchange for approximately $270 in repairs to get them back on the road, the owners gave 3 monkeys, a goat and 2 black bears. These six animals were the beginning of the Crandon Park Zoo at Crandon Park on Key Biscayne. 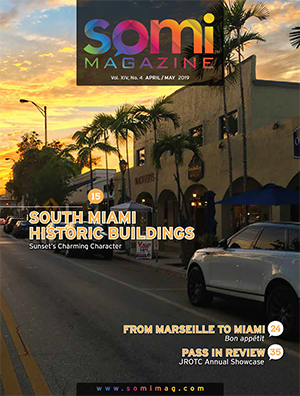 The Key Biscayne property was donated by the Matheson family to the county in 1940, and was named after Charles Crandon, a well-respected county commissioner. At Crandon Park Zoo as was the practice in those days, animals were kept in cages. 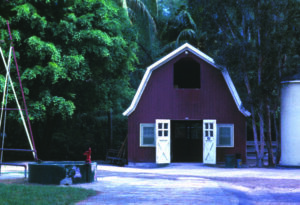 The Children’s Barn was a popular attraction at the Crandon Park Zoo. On August 26, 1967, Miss Miami welcomed the arrival of two Asian elephants “Dahlip” and “Seetna.” “Dahlip” now still lives at the ZOO Miami. 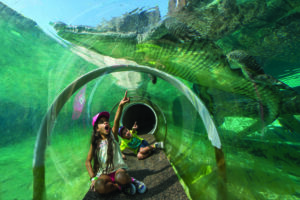 Eight years in the making, MetroZoo was ready to receive the animals from the Crandon Park Zoo – it was likened to a mini Noah’s Ark moving across the Rickenbacker Causeway and down US1 to the new zoo on SW 152 Street. It took months to move all the animals to their new home. The majority of the exhibits were built in the 1950s. When completed in 1969, the zoo consisted of 25 developed acres on a 48 scenic acres, The animal collection rose to over 1,200. Some Galapagos tortoises, monkeys and pheasants were added from the Matheson’s Key Biscayne coconut plantation. Gifts of animals: two Asian elephants, a white tiger, pair of Indian Rhinos given by Ralph Scott, a noted world traveler and philanthropist. 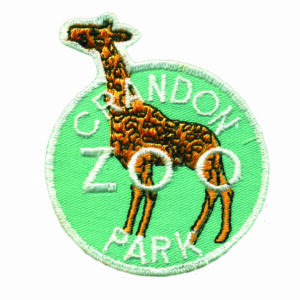 By 1967, the Crandon Park Zoo had grown to over 1,200 animals, and was considered one of the top 25 zoos in the country. And of note, in 1967, the zoo had the first aardvark born and raised in captivity. The zoo was popular and hosted over one-half million people a year, with a Children’s Zoo Barn, a favorite spot for many visitors. However, if the zoo was to grow, the challenge was the need for additional land to expand. Key Biscayne was also highly susceptible to hurricanes. In 1965 Hurricane Betsy flooded the zoo and killed some 250 animals. After the hurricane there was talk of a new zoo for Dade County, but not until December 1970 did county officials apply for land in the Richmond Naval Air Station property. This expansive inland location was desireable for development of the county zoo. On November 7, 1972, the Dade County electorate voted in favor of the issuance of the County’s Public Improvement Bonds, also known as the “Decade of Progress Bonds,” in the amount of $553,100,000 to provide funds for infrastructure improvements in sewer systems and solid waste facilities ($100m), health care facilities ($88.6m), the public library system $34.7m), street and safety improvements ($113.5m), and recreational and cultural improvements and facilities ($75.8m). $8,000,000 was identified for a Zoological Park, which included construction of animal exhibit areas, acquisition of animals, educational facilities, internal transportation system and all necessary support facilities. The zoo was to be located on the old Richmond Naval Air Base, which housed blimps during WWII. Prior to the November vote, in August 1972, the US Secretary of Interior announced that approximately 1100 acres would be turned over to the County as the site for the new zoo. And so, a new METRO ZOO came to be. The only tropical zoo in the continental United States, the zoo would have a zoogeographic theme, which exhibit areas for wildlife from Africa, Asia, Europe, South America, North America and Australia. 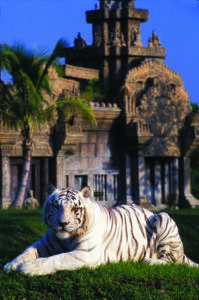 The Tiger Temple, modelled after the 12th century temples of Anglor Watin Cambodia is considered to be the crowning jewel and iconic exhiibit at the new zoo. 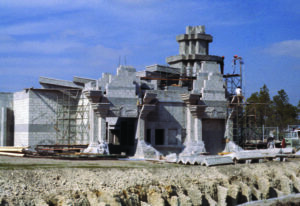 On the weekend of July 4th 1980, the 25 acre Preview Center opened to the public. On December 11, 1981 there was a Grand Opening Dedication Ceremony of the 160 acre site. A “Piece of the Past” souvenir bag containing a piece of the original bars used to cage the animals at the Crandon Park Zoo was given out as a representation of the decision that bars will no longer be used to house the animals. In the 1980s, the zoo continued to expand. 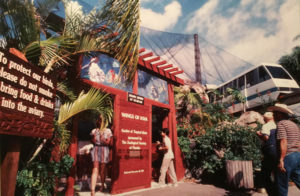 An additional 25 acres with six new African hoofed stock exhibits opened in 1982, along with the zoo’s monorail in 1984. After the closing of 1984 Louisiana World Exposition in New Orleans, monorails were re-used at Miami MetroZoo. On December 28, 1984 the original “Wings of Asia” exhibit opened on 1.5 acres, with approximately 300 birds of 80 species. A 65 feet high mesh ceiling covered the most innovative free flight aviaries in the country. Three additional African hoofed stock exhibits followed in 1985, and two new exhibits were opened in the African savanna section in 1986 with elephants and black rhinos.In 1988, the Australian lobe opened, featuring koalas, kangaroos and wallabies. PAWS, the children’s petting zoo, opened in 1989 replacing the original area called “Sulawesi.” The Asian Riverlife Experience opened in August 1990 featuring small-clawed Asian otters, a blood python, Malayan water monitor, clouded leopards, and land tortoises, among others. 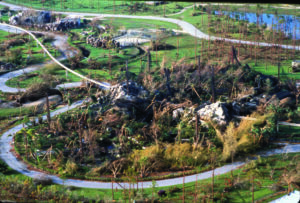 In 1992, the zoo suffered extensive damage when Hurricane Andrew made landfall in South Florida on August 24. The small, yet intensely powerful category 5 hurricane toppled over 5,000 trees and destroyed the Wings of Asia aviary. The aviary which had been built to withstand winds of up to 120 miles per hour, suffered the loss of approximately 100 of the 300 resident birds. 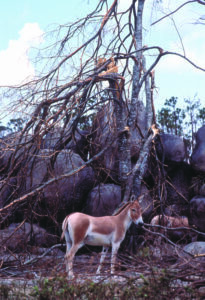 Despite the majority of the zoo’s animals remaining outside during the duration and aftermath of Hurricane Andrew, only five animals were killed from either debris or the consumption of contaminated water. 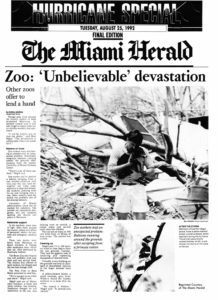 MetroZoo, though looking dramatically different, was reopened on December 18, 1992 with the zoo’s Tiger Temple exhibit being rededicated in memory of Naomi Browning, 12, a zoo volunteer killed in the hurricane. Naomi had told her mother she was worried about the zoo’s animals the night of the storm. 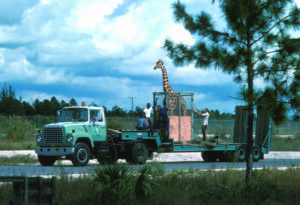 By July 1993, many of the animals that were sent to other zoos and animal parks across the United States during the zoo’s reconstruction had been returned to MetroZoo, and over 7,000 new trees had been planted to begin restoring the zoo’s tree canopy. The Falcon Batchelor Komodo Dragon Encounter opened that same year, followed by Andean Condor (1999), Meerkats (2000), Cuban Crocodiles and Squirrel Monkeys (2001), and Dr. Wilde’s World, which is an indoor facility for traveling zoological exhibits. The rebuilt Wings of Asia aviary, housing more than 300 individuals representing 70 species of birds, opened in the spring of 2003. 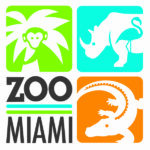 As part of the zoo’s 30th anniversary celebration, on July 4, 2010, the zoo was renamed the Miami-Dade Zoological Park and Gardens, or ZOO Miami, for marketing and branding purposes. The zoo broke ground on a $43 million project that included an Everglades exhibit and a new state-of-the-art entryway. Visitors to ZOO Miami now enter the zoo in a whole new way. Opened in mid July 2016, the $19 million state-of-the-art Entry Plaza features a new ticketing offices, a 3,500 square-foot gift shop, as well as a 2,300 square foot “Florida Room” to host public and private events. 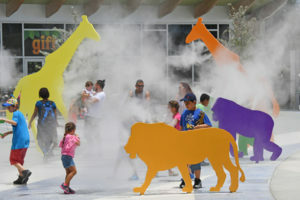 Visitors are greeted with a sleek 3D Zoo Miami sculptural sign, colorful life-size animal silhouettes, and a lit 50 foot ZOO Miami tower with informational LED screens at its base. Some of the animal silhouettes contain misting features to cool down our guests and all of the animals represent a migration to a “watering hole” – the beautiful flamingo pond. This will be the first time an animal exhibit is accessible to guests prior to the turnstiles. The plaza is partially shaded by a “cloud-like” roof structure, which provides a contemporary aesthetic for entry, exit, day and evening events. When the Entry Plaza opened mid-year 2016, it heralded the much anticipated opening of the Florida: Mission Everglades exhibit later that year in December. Construction on this new $33 million, 4.5 acre exhibit began in May 2014, and after two and one-half years, this singularly unique Everglades-themed exhibit enjoyed a celebrated opening on the weekend of December 10 & 11, 2016. 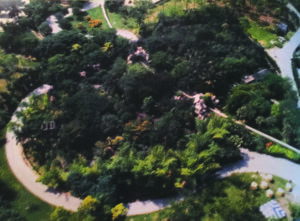 The Florida: Mission Everglades exhibit marks a significant development in ZOO Miami’s history, following successful openings for the Wings of Asia aviary (2003) and Amazon and Beyond (2006). Florida: Mission Everglades is designed to encourage Florida residents and visitors, to take a deeper look at wildlife and conservation efforts in our own backyard. The exhibit is a unique “gateway” to experiencing the actual Everglades National Park, and it features state-of-the-art interaction and informative displays about the significant animals found in South Florida. 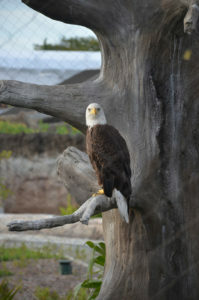 Florida: Mission Everglades takes children and adults alike into the different habitats found in the heart of Florida. Guests journey through habitats of iconic Florida animals like the roseate spoonbill, the Florida panther, black bear, burrowing owl, gopher tortoise, bald eagle, American crocodile, American alligator, Florida box turtle and more. Some 60 species of animals are represented, and the exhibit highlights the importance of conservation for animals listed as endangered or threatened in the wild. 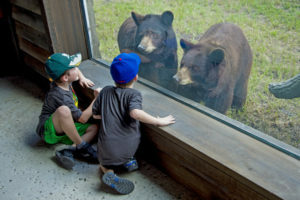 Kids and adults come face-to-face with a ferocious bear as they explore hammocks and pinelands, and slide through the water where river otters play. 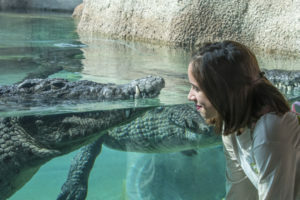 Guests experience alligators and crocodiles in a new way as they wander over a rickety bridge and through an acrylic underwater tube. Adding entertainment to education, the exhibit also features a special “Lostman’s River Boat Ride” as well as interactive exhibits designed to give visitors an up-close look at the animals. 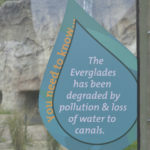 These exhibits come together to help visitors understand ZOO Miami’s collective mission of trying to save the Florida Everglades. This one-of-a-kind exhibit is rivaled only by an actual trip to the Everglades. Everglades National Park Rangers frequent the exhibit, interact with the guests and provide personal insight about the Everglades. 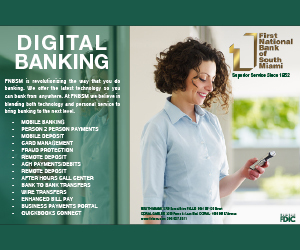 These projects were collaboratively undertaken by the Miami-Dade Parks, Recreation and Open Spaces Department, ZOO Miami and ZOO Miami Foundation. Insight on interpretive elements was provided by the Everglades Foundation and Everglades National Park. 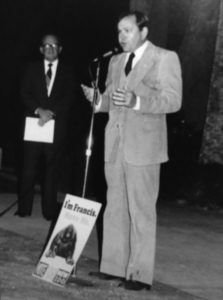 Pictured here at the opening of the zoo in 1981, Merrett Steirheim is recognized as an outstanding public servant and administraitor. 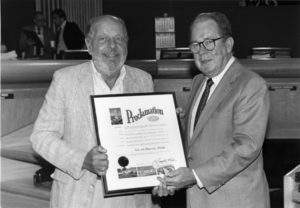 Stierheim first served as County Manager from 1976 to 1986 and successfully supervised a $5 billion countywide infrastructure expansion which included among other major projects, the construction of Miami MetroZoo. His love for the zoo led him to serve as the first chair of the Zoological Society, a fund-raising arm at the Zoo. Pictured here with Mayor Stephen P. Clark, Bob Yokel, was widely known for his no- nonsense leadership style. 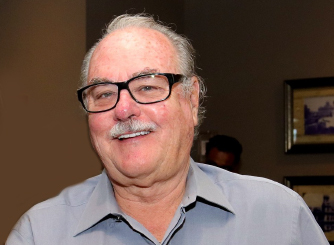 In 1977 he assumed responsibility as Supertinedent for the Crandon Park Zoo and rejuvenated the aging park before spearheading the development and construction of Miami-Dade MetroZoo, one of the world’s first cageless zoos, and served as its first director until 1995. Reflecting on his first boss of 37 years ago, Ron Magill notes: “His soul built this place.” Upon his passing Ron had a portion of his ashes encased in the Tiger Temple. 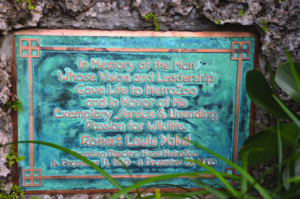 On the path in front of the Tiger Temple a plaque in coral rock reads: “In Memory of the Man Whose Vision and Leadership Gave Life to MetroZoo and in Honor of His Exemplary Service & Unending Passion for Wildlife. Ron Magill is the zoo Communications and Media Relations Director. 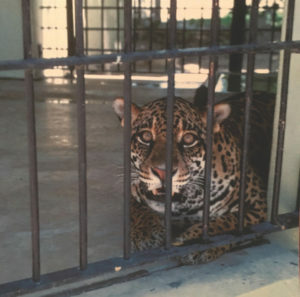 He is an internationally recognized zoological authority, and for some forty years, he has had hands-on experience with a wide variety of wildlife both in captivity and in the wild. 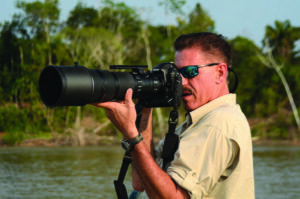 He is an internationally known wildlife photographer and one of only 12 Nikon Ambassadors in the USA. One of only two current zoo staff that worked at the Crandon Park Zoo, Ron Magill embodies the history of ZOO Miami. And SOMI Magazine spent some time with him to learn more about him and the zoo. Growing up in Queens, New York, Ron and his family would often visit The Bronx Zoo. Reflecting on his years at the zoo, the one person that truly impacted his life and career, and for whom he holds in high esteem is Bob Yokel, the zoo’s first director and his first boss. 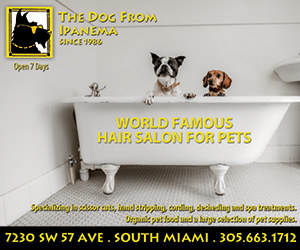 Now twenty-five years this August that the hurricane ravaged South Dade and MetroZoo, Ron notes in hindsight that it was a “mixed blessing of sorts,” with increased notoriety which translated into phenomenal support from the Miami community and well beyond. The zoo “rose like a phoenix” with the rebuilding of the Aviary, other new exhibits and community collaborations. 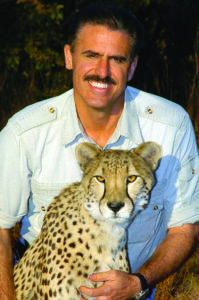 Ron’s proudest professional accomplishment is the establishment of the “Ron Magill Conservation Endowment” at the Zoo Miami Foundation. 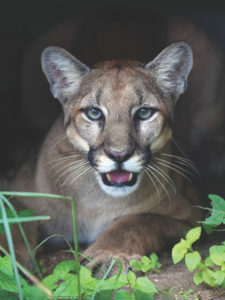 This endowment is the largest of its kind at the zoo and generates tens of thousands of dollars annually to wildlife conservation by providing annual scholarships as well as supporting field conservation projects designed to protect wildlife in the wild areas where it is naturally found. 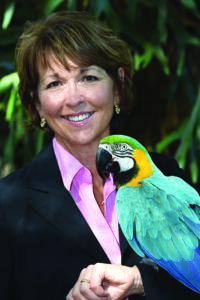 Since Bob Yokel, Carol Kruse, an accomplished public administrator, is the third director of the zoo.